Photo by Jim lennon. St. Patrick's Day Parade 2013, Goshen, NY. Photo by Michelle Capuzzi. LtoR Julian Ayuso, Raymond Capuzzi and Ryan Ayuso. 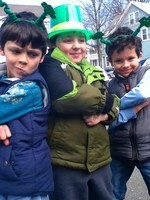 Photos of the annual St. Patrick's Day parade in Goshen, NY.